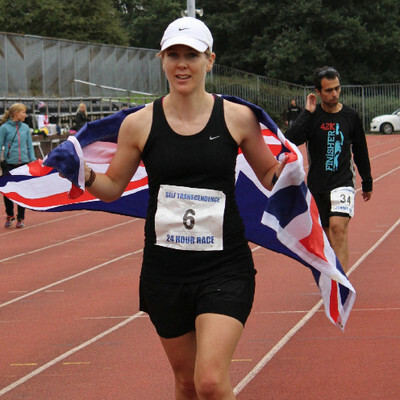 Marco Consani and Fionna Cameron both gained astonishing victories at the annual Self Transcendence 24 hour track race in London on 21st-22nd September, and in the process also achieved the GB 'A' selection standards. The whole goal of a 24 hour race is to see how much distance you can cover in 24 hours. Circling the 400metre track 620 times in the 24 hours, Consani clocked up a total of 154 miles (248.1 km), a distance that moves him to third in the Scottish all time 24 hour list behind Don Ritchie(166miles) and Mick Francis (155 miles) and also in the top 20 all time GB performers. Cameron covered 134 miles (216.6 km) with 541 laps of the track, which co-incidentally places her third on the Scottish all time ladies list behind Sharon Law (140 miles) and Debbie Martin-Consani, Marco's wife (136.7 miles). Consani, who had placed second in this year's 95 mile West highland way trail race was running his first 24 hour event, his intermediate splits for the race were 4 hours 28 min 37 sec for 50km; 8.54.40 at 100km; 100miles in 14.31.01; 200k in and 150 miles in 23.06.18. The quiet and unassuming Consani said afterwards "Coming into the race I had two goals" said Consani, "the first was to try and beat Debbie's 24 hour distance. The second was to try and reach the GB standard, and I am really chuffed to have done that. I really want to thank everyone who supported and encouraged me both during and before the race." Fionna Cameron was also running her first 24 hour event. A second place in this years 53 mile Highland Fling race in April, which incorporated the Scottish and GB ultra trail championships, had gained her selection for the World trail champs in Wales in July. Her splits were 4 hours 45 min 45 sec at 50km; 9.19.43 at 100km 15.58.00 at 100miles and 200k in 21.32.02. "Wow, that was so tough," said Cameron afterwards. "My shin was really sore in the last few hours, which was a bit frustrating, as I feel I could probably have gone further. I am so happy to have achieved the GB qualifier too." Scottish ultra distance team manager, Adrian Stott who was at Tooting as one of the key officials said, "Many people in the wider sporting community, still perceive that ultra runners are a little strange! What Marco and Fionna have shown though is they are really just like other sports folk embracing their own challenges. We are lucky to have some very talented ultra runners in Scotland just now, who are prepared to listen and learn bring their own ideas too and target specific events and, and compete with the best in the UK and beyond. The weekend's results speak for themselves."